Updating the look of your RV, truck or boat can be as easy as printing a new vinyl wrap and applying it. Let your creativity go into full force as you design an image that can represent you and/or your business. 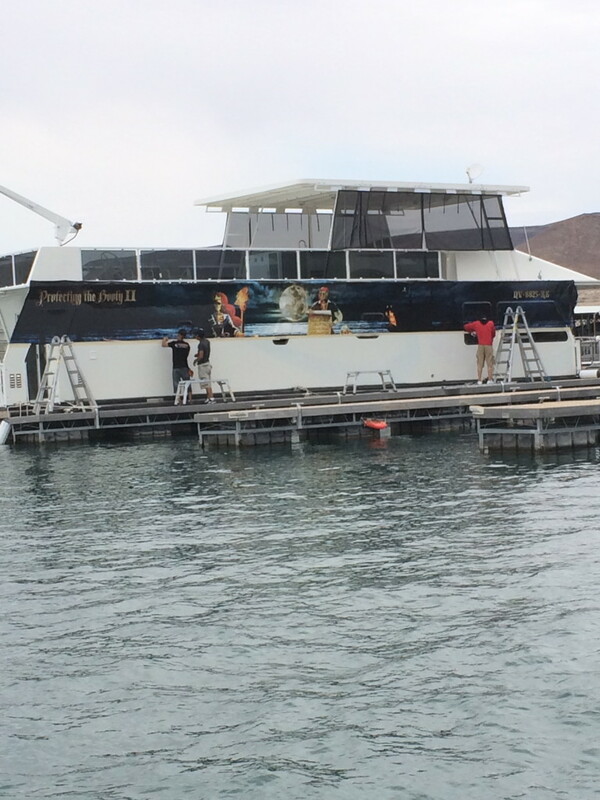 Here’s how to print on a large format printer and how to vinyl wrap a large object (truck, houseboat, rv). Roland SOLJET Pro 4 XR-640 is the best large format printer on the market! This wide format (64 inch) plotter and cutter is precise, quick and efficient. Offering the use of 8 different colors with 4 different color variations. These large format prints are so vivid and offer up a “wow” factor unlike other printers. This printer is perfect for banners, signs, decals, vehicles, boats, etc. Most people will design their large image in Photoshop Illustrator and then send it to Roland Versaworks Rip Program where you can then tweak your design as needed. You can adjust the ink amount that goes onto the vinyl, adjust the colors, or flip the image if you are printing on two sides of something. When it comes to vinyl wrapping a large object you first want to take accurate measurements of whatever you plan on wrapping. For this post we will be talking about a houseboat, so we took overall measurements, took some photos of the houseboat and took measurements of all the windows where there wouldn’t be any vinyl. Some vehicles will have exact templets of the vehicle make and model that you get online, this doesn’t apply with a houseboat, but for other large vinyl jobs it is convenient. Once you have your measurements and templet made then you can begin the design process in Photoshop Illustrator. Adding in ghost images that overlap to create depth, business logos/brands, splatters, dripping ink pieces, shadows, themes… let your creativity run wild! Then transfer your image to Versaworks and get ready to print. If you are printing on Avery or Oracal you want to do a color profile to ensure that your colors print the way you intend for them to look. Most people will pick a piece of their artwork to test print. However, some vinyl printers do NOT do test prints unless there is a specific pantone color that they need to match for brand recognition (think of McDonald’s golden arches). You can choose to print your image vertically or horizontally depending on the surface you are wrapping, how many people you have to helping you, and by the number of seams that you will want to have. The picture below shows a houseboat being wrapped horizontally which look challenging, but they had enough guys helping to make it work. Also their design was very detailed so it was probably a smarter choice for them to have just one seam to have to worry about lining up rather than 5 or 6. When you get to the actual vinyl wrapping process you first want to clean and prep it. Some people will detail their vehicles before, but for a houseboat you can spray and wipe down RapidPrep. Once the surface is fully dry then you can begin to wrap. If you are wrapping vertically then you would tape the middle, cut the backing off of the top and apply the top vinyl piece first. Then you would apply the bottom piece. If you are wrapping horizontally you would tape along the bottom edge, flip it down, peel off the backing and cut off the backing as close to your cut edge as possible. Then flip it up and start squeegeeing from the middle out. Using a wet edge squeegee with a wet application usually works best so that you don’t scratch the image. You can get a Wet Edge Squeegee here and the Rapid Tac application fluid here. Ducky Vinyl Wrap is the fluid to finish the job. This will remove all the water spots, protect and enhance the shine of your nice new wrap! Call us today for help on your next large format job.